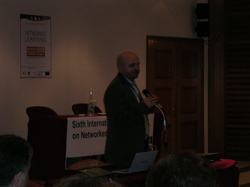 The first day of the Networked Learning conference got off to an excellent start with a thought provoking keynote by Charalambos Vrasidas from the University of Nicosia in Cyprus. His talk was entitled ‘social networking for Social Justice: Challenges and Possibilities’. I can’t really do justice (bad pun there) to his talk but will have a go at summarising it. He began by arguing against Friedman’s notion of a flat world, cure suggesting instead that the world is ‘spiky’ (Florida, 2005) with huge discrepancies – particularly between the developed and developing countries and quoted Fraser ‘Economic disadvantage impedes equal participation in the making of culture – in public spheres and everyday life’ (Fraser, 1997). He argued that inequality and injustice are evident in all spheres of life to both the developing and developed world and posed the question of how technologies might provide some means of addressing these problems in ‘Social Justice eEducation’, i.e. pedagogies and policies to improve the learning and life opportunities of underserved students (Cochran-Smith 2004). He went on to present some sobering statistics around social injustice and poverty – such as the fact that in 2004 1 billion lived below international poverty line, quoting Kharnarov and Mandela: ‘Poverty is like punishment for a crime you didn’t commit’ (Eli Khamarov) and ‘Eliminating poverty is not a kindness, its an act of justice’ (Nelson Mandela). He contested the notion of ‘Education for a better quality of life’ raising the question is education for all? And in particular whether UNESCO target of education for all by 2015 was feasible given that 72 Million kids don’t have access to education and there are 774 million adult illiterates. He then went on to look at social networking, listing their key characteristics (the ability to connect with friends, find new friends, share information, get updates on topics of interest, etc.). He was particularly interested in how social networking might be applied in the context of social justice education and showed a very powerful short video produced by amnesty international entitled ‘your signature counts’, in terms of how individuals can make a different. The video was an excellent example of online activism with strong use of visual narrative and music as a means of getting the message across. He then gave a number of examples of how technologies are being used to solve real problems – here’s a summary of some of the examples – many of these are available as case studies online. The potential of Open Educational resources (www.oercommons.org), however he argued again ‘open for whom?’ – what languages are these resources available in? what kinds of infrastructure are provided? Where are the teachers to support the use of these – quoting Warschauser (2003) ‘physical access to technology is not the only thing that matters’. Virtual University Small States Commonwealth – VUSSC consortium of institutions that aims to address education needs in small states of the commonwealth (John Daniels). Aim is to share educational resources and tools. Participating countries (22) with very diverse needs across the different countries. 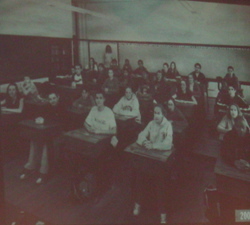 Example activities include the Mauritius bootcamp in August 2006, the Online masters degree in ITT (Pacific) Western Illinois University, the LUDA Virtual High School (www.ludavhs.org) Consumer education online, focusing on at risk students. World food programme - food force www.food-force.com what can we do to alleviate hunger in the world? There is an online community for this game and associated lesson plans. It has a very engaging introduction to the game, which sets up a real and very authentic, problem and then the user is on a mission to solve this. 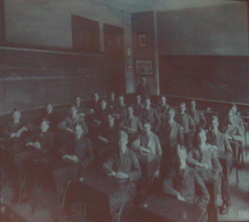 He then showed two images of a classroom, 100 years apart but essentially the same - – not changed in 100 years, and ask the question - where is the technology? He used this as a introduction to a Technology Integration Framework that he has developed which attempts to address this lack on impact of technology on education and is designed to adopt a systemic, holistic approach looking at various factors which need to be considered to bring about change such as: policy (sustainability, a systemic approach, involvement of stakeholders), curriculum (pedagogy and assessment0, teacher practice, technology and infrastructure, ongoing support, research, evaluation and reflection. This systemic approach is needed because the school culture is deeply embedded and complex depending on a range of inter-connected factors. He then gave some more examples. He concluded by promoting this systematic view and argued that teachers and learners need time to engage with these new possibilities, time to UNLEARN, time to become part of new communities and time to reflect. A very inspiring and thought provoking keynote. This entry was posted on Tuesday, May 6th, 2008 at 10:54 am	and is filed under Conferences. You can follow any responses to this entry through the RSS 2.0 feed. You can leave a response, or trackback from your own site. Thank you very much for this stimulating text about the presentation by Charalambos Vrasidas. I did’t know him. Very interesting stuff. I think we do not know how strong individuals can be like the video says and we don’t know what strong possibilities are in technology and it’s on us to turn them in the right direction. yes it was a great keynote - really made me think and some very power messages. The conference overall was excellent have a stack of notes i need to turn into blog entries! Yes agree - its an option of choice for many people now..
online education is also great specially if you do not have time to attend regular schooling;.. I agree interaction between teacher and students is important, but open education can still be valuable and can be used in a formal teaching context as well as by the students individually.